Nephila clavipes - This is the ventral view of the same spider in the above photo. Nephila clavipes - The large spider in the middle of the photo is a female; a much smaller male can be seen in the upper-left corner of the photo. 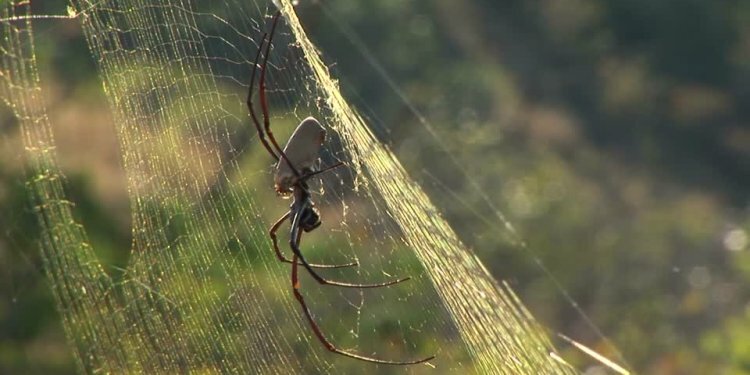 Nephila clavipes - These are the same spiders as in the above photo. Nephila clavipes - This substantially smaller male was one of two found in the same web as the large female in the above photo. Nephila clavipes - (female) dorsal view, poised in center of web. Nephila clavipes - (female) This is the same spider as in the above photo. Nephila clavipes - (female) ventral view, near morning glories (Ipomoea purpurea). Note the thick, extremely strong, golden dragline silk at the top of the web as well as other support lines in front of the main orb. Nephila clavipes - These eggs were laid and wrapped in golden silk, attached to an office window pane a few inches from the bottom of a female's large web, also in front of the same window. This photo was taken from inside, through the glass a few days after she laid the eggs.